Earlier this summer, endlessly hateable jerk-face Martin Shkreli was convicted of fraud, and while he hasn’t been sentenced yet, the judge on his case has just revoked his bond. That means he’ll now be in jail until his sentencing hearing later this fall. Oddly, the decision wasn’t because Shkreli tried to con sick people or scam would-be investors again, it was because of a weird thing he posted on Facebook. As we reported earlier this month, Shkreli recently joked (?) on social media that he would give one of his Facebook followers $5,000 if they could grab some of Hillary Clinton’s hair for him during her book tour, and though he later shared a post saying his comment was “meant for humor,” he still got a visit from the Secret Service about it. As it turns out, the organization isn’t a big fan of convicted criminals asking people to run up and grab the VIPs they’re supposed to protect, and now it looks like judges also don’t think it’s very funny. As reported by The Washington Post, U.S. District Judge Kiyo Matsumoto said during a hearing that Shkreli’s post was “a solicitation of assault,” meaning—even if it was intended as a “joke”—it is not protected by the first amendment. 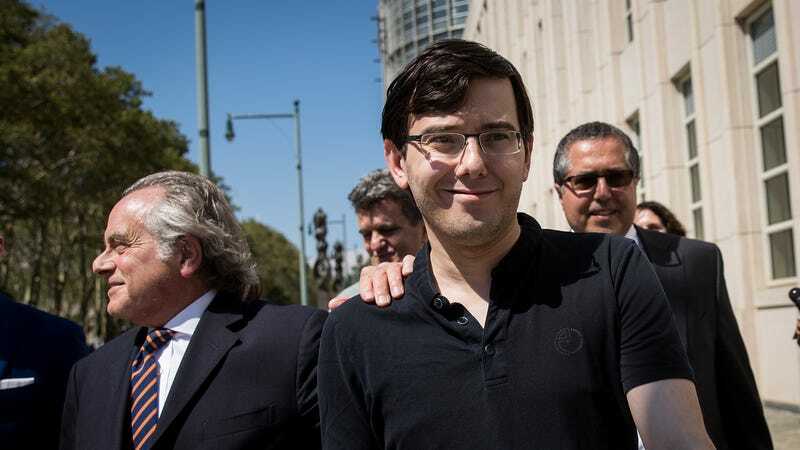 Shkreli, who was immediately taken into custody after the hearing, is facing 20 years in prison. He also apologized to the judge for his “awkward attempt at humor,” but Matsumoto said that he “should have apologized to the government, the Secret Service, and Hillary Clinton” instead.